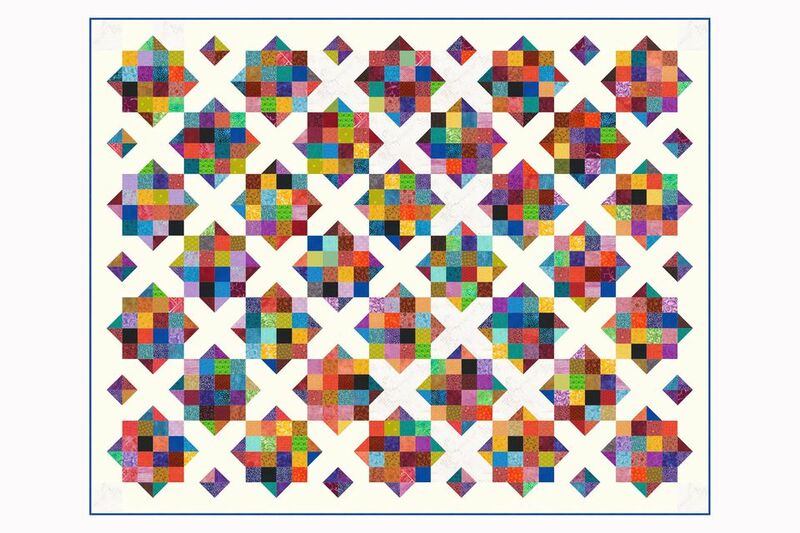 Pattern designers have written several variations of this type of traditional quilt layout, which looks complicated at first glance but is really quite simple to construct. This pattern includes a couple of different options to help you make the best use of existing fabrics. Sew the Sixteen patch quilt blocks with either scraps or long strips of fabric or a combination of the two. The X quilt blocks are quick pieced using a simple technique. 2-1/2" wide Jelly Roll strips can be used to make this scrap quilt but sew with your own rotary cut strips if that's a better option. Take a look at the last three pages of the pattern to see slightly different versions of the quilt. One is made with less patchwork in the border, another illustrates the quilt if you swapped the light background with black, and the third shows how the quilt would look if blocks change position in the layout. The example quilt has a white background. We do recommend that you use the same background throughout the quilt to provide a constant backdrop, but the color needn't be white. You might choose to change color value (contrast) entirely and sew with a very dark background as shown on page 8. It's difficult to calculate exact yardages for a scrap quilt because each quilter works with scraps of different sizes. We will give you an estimate. About 285 running inches of continuous doublefold binding to finish at 1/4". Since the quilt has a border on its outer edges you could use a wider binding but take care to follow correct mitering instructions for binding sewn to the quilt with a wider seam allowance. We recommend that you cut enough squares to make one or two test quilt blocks before cutting all of your fabric. Learn how to cut patchwork shapes. Use chain piecing to speed up assembly after you've determined that units and blocks are accurate. Create 128 rows of patchwork to create 32 Sixteen Patch quilt blocks. Each completed row should measure 2-1/2" x 8-1/2". Each completed quilt block should measure 8-1/2" x 8-1/2". Beginners should read Strip Piecing Tips for Quilters. Ideally, seam allowances in adjacent rows should be pressed in opposite directions to make it easier to match the intersections. That probably won't be possible, so match and pin the intersections before sewing. The quilt is illustrated in landscape mode, on its side. Print the image and flip it around if you prefer to visualize and work with shorter rows. Make sure all blocks measure 8-1/2" x 8-1/2" before you begin. If some do not, try one of these easy ways to fix problem quilt blocks before sewing them into the quilt. This variation of the quilt does not include the extra border patchwork needed to connect with the outer X quilt blocks. The quilt's appearance changes dramatically when you replace all light background pieces with black or another very dark fabric. This version of the quilt is reminiscent of a Jewel Box quilt.